Nahri has never believed in magic. Certainly, she has power; on the streets of 18th century Cairo, shes a con woman of unsurpassed talent. But she knows better than anyone that the trade she uses to get by–palm readings, zars, healings–are all tricks, sleights of hand, learned skills; a means to the delightful end of swindling Ottoman nobles. But when Nahri accidentally summons an equally sly, darkly mysterious djinn warrior to her side during one of her cons, shes forced to accept that the magical world she thought only existed in childhood stories is real. For the warrior tells her a new tale: across hot, windswept sands teeming with creatures of fire, and rivers where the mythical marid sleep; past ruins of once-magnificent human metropolises, and mountains where the circling hawks are not what they seem, lies Daevabad, the legendary city of brass–a city to which Nahri is irrevocably bound. When I picked up The City of Brass, I was a little intimidated. 500+ pages of historical fiction is a big ask when I’m reading to a deadline. However, my worries turned out to be unfounded. The City of Brass was a delight from beginning to end and I tore through it in no time. The story is told in close third person from two points of view. The first three chapters come from Nahri, a young woman with a magical talent for healing. As an orphan, she uses this talent to help swindle the rich. She is first and foremost a survivor, looking to get by and perhaps one day leave Cairo to train as a doctor. After one of her fake rituals goes wrong, she flees the city in the company of a djinn she accidentally summoned. He convinces her to travel to the mysterious city of Daevabad to learn the truth of her heritage. Which is where the second POV character comes in. Alizayd al Qahtani is the second-born prince of Daevabad. He’s a man of rigid convictions who finds himself sympathising with a rebel faction within the city. This puts him in a precarious position when his father places him in command of the city guard. It also places him at odds with Nahri. This is a novel of shifting alliances and shades of grey, which is one of the reasons I loved it so much. None of the factions are shown as uniformly right, but engage in manipulation to further their ends. Even the faction advocating for the middle way arose from a history of violence, use dubious methods, and are mostly in it for their own power. The story also recognises that there are multiple factors at play–unlikely friendships form, despite political and religious differences. Speaking of religious differences, it was refreshing to see an epic fantasy where the characters are predominantly Muslim. Nor is it made a big deal, though Ali’s strict adherence to abstaining from alcohol is a source of friction between him and his brother. Being Own Voices allowed the story to include elements that I may have otherwise found dubious. Any story written by a white, non-Muslim author featuring a Prince Ali and a magic carpet would have had to do a lot of work to convince me it wasn’t a stereotyped joke. Despite starting out as historical fantasy, the historical elements don’t play a large part. Once Nahri leaves Cairo, the story comes across more like a secondary world fantasy. It will be interesting to see if this shifts in later books. The style was very readable and the pacing was faster than I was expecting, at least at first. It slows down in the middle of the book to concentrate on developing relationships between characters and factions, then picks up again at the end. I found the shifts in the status quo gave enough resolution to be satisfying while simultaneously opening up whole new issues to be dealt with in the next book. 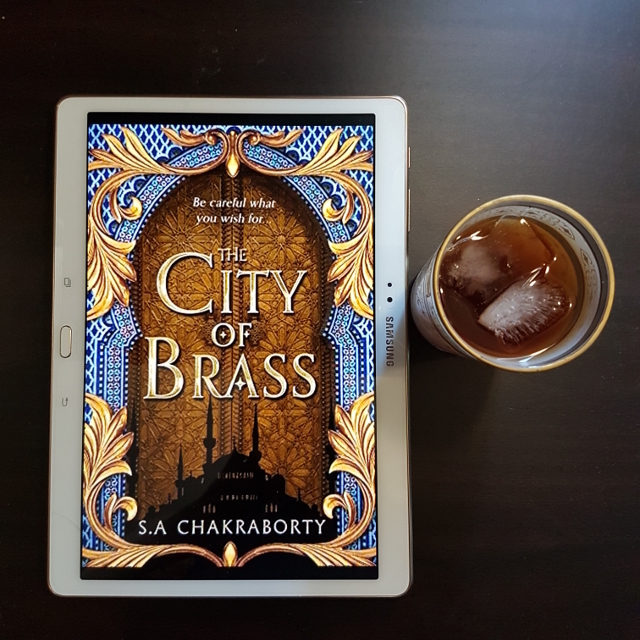 The City of Brass was a brilliant start to a new series and to my reading year. My pleasure! As I said, the size rather intimidated me, but it gets into the action really quickly. I’d love to hear what you think of it once you’re ready. I enjoyed this book so very much! And I can say that I interviewed the author for my Lady Business column, and she said that we haven’t seen the last of Cairo. I’m pretty into that, although I also very much enjoyed the more secondary-worldy parts of the book set in Daevabad. Altogether it’s a great start to a new series, PLUS it has a super beautiful cover. Oh, how exciting! I’ll definitely have to check out the column. I’ve got some bets on which character ends up in Cairo after that ending. Of course, the sad thing about reading the book as soon as it came out is that we’ll have to wait FOREVER for the next one. I’m glad I have company there, though.